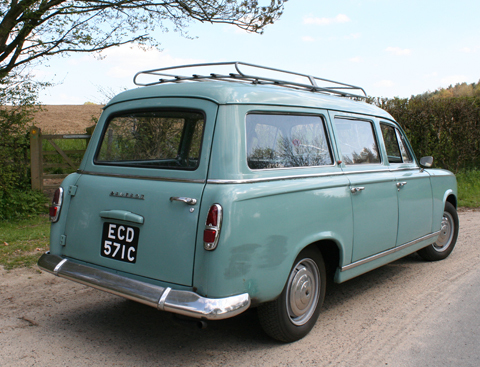 A Rare Right-hand Drive 403 Estate Car imported into Great Britain in 1965 from Rhodesia. It Comes with an Extensive History File. The French have a much greater appreciation of their motoring history than us, with many models accorded the status of a national icon. We take our motoring history for granted, and the majority of folks here don’t know one marque from another. Though the Peugeot 403 is one of many French transport icons, it was a very important one in its day, being Peugeot’s first million-selling car, establishing the company on the world stage. Over the years, the model was nicknamed l’Increvable. Designed by Pinin Farina, and 15 feet long, the Break version filled a niche market very successfully in France. But, despite its reliability, it was expensive as in import in Great Britain, and we already produced enough estate cars and shooting brakes to prevent much sales success here. 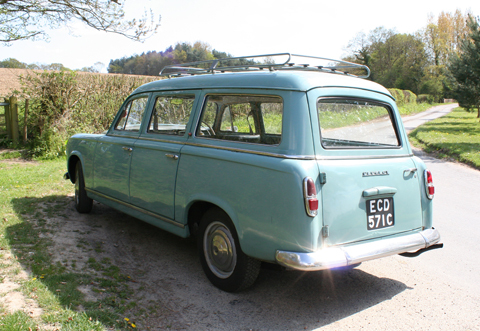 The ‘Break’ Estate Car version (Familiale or Commerciale) was well-known for its use by the Gendarmerie. I bought this beautiful 403 Break a year ago from my old friend Ian, who shared an appreciation for unusual stylish vehicles. It has an interesting history, having been supplied to its original owner Jim Chapman in Blantyre, Nyasaland (now Malawi). 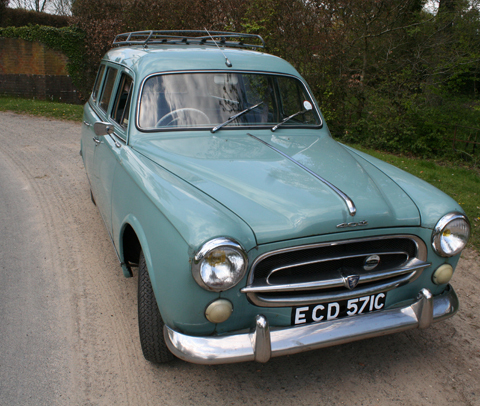 Jim was a forestry officer there, and he bought the car on 15th July, 1960. The original choice had been a Standard Estate, but he could not get one supplied to Rhodesia (the Federation of Rhodesia and Nyasaland, as it was known at that time, embraced Zambia, Zimbabwe and Malawi). His first car when he’d started work for the Nyasaland Forestry Dept in 1952 had been a Peugeot 203 family car which he converted to a station wagon. So he settled on a the new Peugeot 403 Break, and it served him well, with travels down to Cape Town, around Zambia and, later, around Great Britain, Jordan and Syria. The picture above, from 1960, is at the Nyasaland border with what is now Mozambique, a border post I passed in 2001, hitching from Mozambique to Harare, Zimbabwe. I considered heading north into Malawi, but didn’t have the necessary visa. I have fond memories of my travels in this part of Africa, which is one reason I bought this Peugeot Break. Jim Chapman now lives in New Zealand, and is aged 96. Ian phoned him after acquiring the car and Jim was delighted to hear that the 403 is still going strong. There’s a comprehensive history file with the car, including many notes by Jim, as well as old insurance policies for the car, from 1960, 1965 and 1967, in Rhodesia, Great Britain and Jordan respectively (reproduced further down the page). Jim sold the Break in 1984. It resurfaced in 2001 and was totally restored by a member of Club Peugeot UK, including a full respray in the original colour. 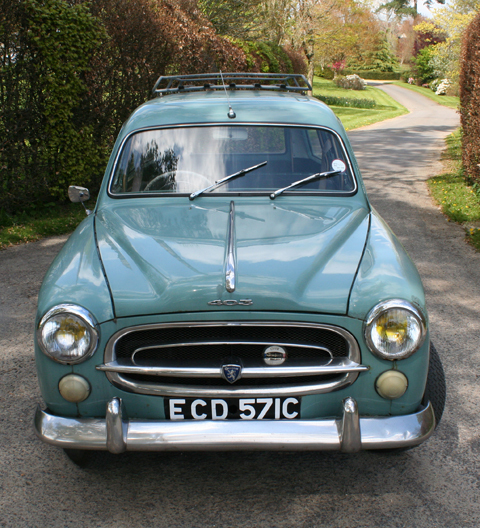 The restorer (Len) found an original Peugeot full-length roofrack for it at an autojumble in Riems, France, while he was motoring around the Champagne area of France in the Break. The car was featured in Practical Classics magazine in June 2003. It’s not in concours condition; there are blemishes here and there in the paintwork, and Ian welded it underneath. But overall it’s in very good condition and extremely presentable. It has 11 months MOT. The 403, launched half a century ago, established Peugeot as a global brand. The time: a weekday afternoon. The television channel: Five. The scene: a murder somewhere in the Universal Studio backlot. Suddenly, amid the black and white Dodge Polara police cruisers materialises a battered convertible driven by someone who appears to have covered themselves in glue prior to dashing through the nearest charity shop. It is Det Lt Columbo en route to arrest Stewart Granger with a dyed-orange face, or an equally villainous elderly film star of similar note. It is a television moment that never fails to cause mass wincing in Peugeot owners everywhere, for the lieutenant’s car is none other than one of only 504 1959 Peugeot 403 Cabriolets. In its heyday, the Cabriolet was Peugeot’s range-topper, with its leather trim, fog lamps, and cigarette lighter. In the US, the 403 saloon was proudly marketed as having “no fins, no excessive trim, no strange shapes” and as being one of the “seven best-built cars in the world”. For once, the copy was more than mere hyperbole. Peugeot embarked on the 403 project in 1950 with a design rationale to produce a car that would supplant, and eventually replace, their popular 1948 1.3-litre 203 saloon and appeal to the re-emerging French middle-class sector. Peugeot believed small cars meant small profits, and that the swingeing taxation on large-engine cars would result in limited sales. What the traditional Peugeot customer apparently needed was a sizeable six-seater saloon powered by a relatively small 1.5-litre engine, a vehicle that would be robust enough for the roads of Francophone Africa and smart enough for Parisian arrondissements. However the original in-house designs of Henri Thomas were deemed too similar to the Franco-American lines of the likes of the Ford Vedette and other voitures des nouveaux riches and so, in 1951, Battista Farina of Turin was commissioned to style project 403. The result was a solid but elegantly understated saloon that would hopefully inject a note of Gallic (or at least Gallic-Italian) dignity on to roads that were already becoming populated with Antwerp-assembled Plymouths – the car of choice of many a French B-film gangster. The new 403 was not exactly designed for speed – its 1.5-litre engine gave a mere 65bhp at 5,000rpm – but its combination of a solid rear axle and simple suspension meant for a robust constitution. As befitting a car for the respectable bourgeoisie, the 403 was pleasantly equipped as standard with a sliding roof, folding armrests and separate reclining front seats. 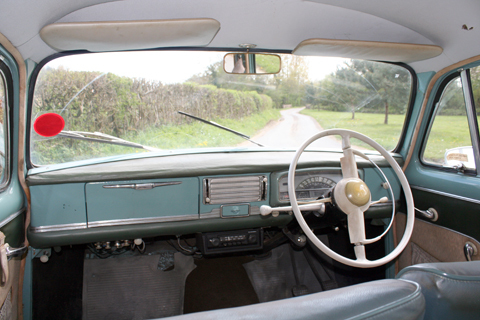 A column-mounted gear-lever made the 403 a genuine six-seater; albeit with the sixth occupant being obliged to perch somewhat precariously between the driver and front passenger. When it was launched, on 20 April 1955, its success was such that by the end of that year its second-hand value was higher than its selling price. 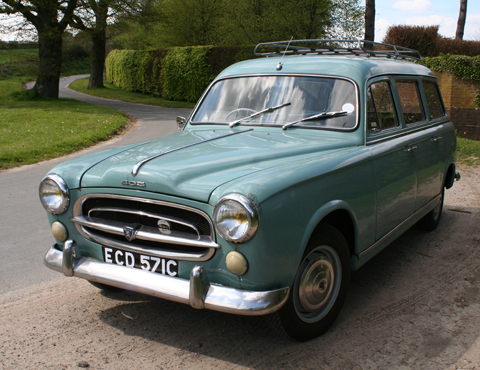 Part of the 403’s appeal in France was due to the fact that it occupied its own niche in the market; the Simca Aronde was much smaller, the Simca Vedette and Renault Frégate were far larger and more expensive – as was the other new French car of 1955, the Citroën DS, while the 1.9-litre Traction Avant Onze Légère was coming to the end of its long run. The 403 was to eschew the tail-fins of Simca and the avant-garde approach of Citroën in favour of low-key sobriety that made it an iconic police car of its era, its 80mph top speed being more than compensated for by the fact that the 403 could apparently take any amount of abuse and, with drum brakes fitted to all wheels, you probably wouldn’t wish to travel any faster. 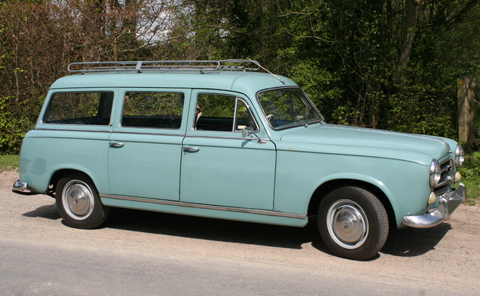 Sweden and West Germany provided the 403 with its chief rivals – the Volvo 122 Amazon and the Mercedes-Benz 180 Ponton. All three were slightly underpowered four-cylinder saloons, all bore a hallmark of quality and all were available with a dashing white steering wheel. And unlike contemporary British offerings such as the Morris Oxford and the Humber Hawk, these continental upstarts placed an emphasis on practicality as opposed to leather, walnut, and carpets. Right-hand-drive 403s are unusual as the UK’s high-import duties in the 1950s and 1960s made the Peugeot more expensive than a Cresta or Zodiac but many Commonwealth countries responded to the 403’s durability and comfort. Peugeot’s approach to the 403’s development was exemplified by continual improvements rather than annual facelifts, with the eight-seater Familiale Estate in 1957 and a diesel engine in 1959 increasing the 403’s appeal to African and South American buyers. In 1960, the millionth 403 left the production line and Peugeot introduced the stripped-spec 7CV saloon for the taxi market but, by this point, the 403 had been supplanted by the 404. Here was a new Peugeot that went so far as to feature vestigial tail-fins. But 403 production continued until 1966, by which time it was nicknamed l’increvable – the indestructible. In the UK, the general public only seems to recognise it from re-runs of The Day of The Jackal, plus a certain US TV series concerning America’s most unlikely detective, but in its homeland the 403 remains an automotive icon – the car that established the Peugeot marque as a global brand. By Andrew Roberts, Tuesday, 10 July 2007, The Independent newspaper. The rear passenger seats fold down to make it either a utility vehicle, or to use for overnight camping. From the model illustration above, this version would therefore appear to be the ‘Commerciale’ Break. The chassis plate records it as a model 403 U5. It still has its original engine, with matching number. The relevant issue of The Motor magazine is included in the sale of this car. As reported in the final page of the road test (above), the petrol filler cap is hidden behind the near side rear light (below). Above you can see the three insurance certificates for this car, while below is a Michelin tyre pressure chart for Peugeots in Rhodesia, categorized by model. The French Dinky model Peugeot 403 Break usually sells in good condition for £100 upwards. As a result, several other model manufacturers now make this car too. Below is the Automic 403 Panel. I like the presentation below of model and photo. Another picture, below, that took my fancy: a Break in a breaker’s yard. We generally think of a vintage car’s history to be what happened to it some time ago. But, as ebay is now so accessible to enthusiasts worldwide, it’s interesting to consider how a vintage vehicle’s sale via this medium becomes part of its historical record. It can also add to its history file, particularly when fellow enthusiasts take the trouble to get in touch. In an ebay classified advert, questions and answers are not automatically published like a live ebay auction. As this Peugeot Break from Malawi seems to have inspired quite a bit of interest from folks who’ve lived in Africa, I’ll update this page accordingly with emails received. Hi, thanks for a presentation that brought back many fond memories of my time with a similar but dark blue 403 Stationwagon in the then Rhodesia. My Dad owned the car but I was able to use it extensively when needed. I remember towing a friend’s race car from Salisbury down to Bulawayo where there was a sportscar endurance race (Springbok series)with many international cars and drivers in attendance such as David Piper. I was telling my wife just now that I nearly burnt out the car the one day. My Dad asked me to look at it because it wouldn’t start so I pulled the distributor cap off to check for a spark which there was and without (stupidly) putting the cap back of I pulled the fuel pipe off the carb to make sure the pump was working. On cranking the engine over the fuel went straight into the dissy and puff, instant engine compartment fire! Managed to put it out with a old sack but spent the rest of the day repairing burnt wiring. What a fantastic car. Thanks again. Hi, I am sorry, I just had to email you after reading your write up on the old peugot, I showed the pics and layout to my mom who remebers Jim Chapman, as does my grandmother, I had to copy the whole page and email it to a number of friends and relatives in Malawi just to see what the response from them all is. I believe that in the family albums I have a couple of photos with this eact car in them, I will do my best to dig them out for you to add to the cars history. I am currently in Worthing, recovering from having been shot in africa in Nov 2007, please do get in touch if you would like to, it would be interesting, especially as I am an avid collector of cars, and waiting for my beloved ’34 bentley to be shipped to UK for me. International purchasers are very welcome – If you live abroad, I’m happy to help arrange shipping for you as long as you pay for the shipping. I do not charge you extra for that service. (I’ve bought vintage vehicles from USA, South Africa and all over Europe; and have sold vintage vehicles to those countries + Canada, New Zealand, Australia, Japan, Hong Kong, Ireland). NORTH AMERICA: for USA, Southampton is the port I’ve used before: I would charge £150 to deliver it to Southampton to the shipping agent (I’ll arrange this for a North American purchaser). If you don’t have a shipper I’ll phone some I’ve used before to find the current cheapest option for you. FRANCE: For French enthusiasts, I live only 10 miles from Newhaven ferry terminal (sails to Dieppe or Le Havre): you could come to my house and collect it; or you could park at Dieppe or Le Havre, come over as a passenger and I’ll meet you with the car for you to drive it back onto the ferry. Though you must pay me in advance. UK: if the purchaser is in UK, I will not deliver anywhere unless it’s very local. So you have 2 options: there are plenty of transport companies advertising on ebay, and most seem very reasonable for north-south deliveries. I’ve found that a part-load delivery (ie when they already have an outbound job) from Brighton to the north of England is usually only £200 or less. If you don’t mind driving a car that gets constant attention and improves you social life 100% then this might be the car for you!